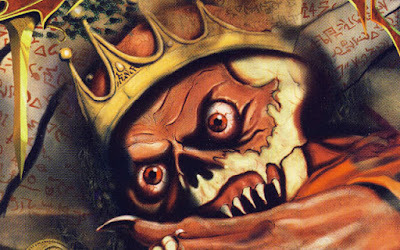 The spectre of King Lysandus ruler of Daggerfall. The second title in the ambitious Elder Scrolls series. 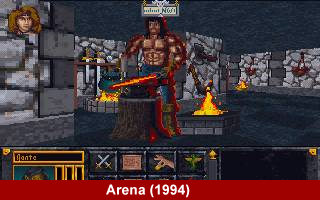 Arena was released in 1994. Back in 1994 a game was released by a small software publisher known as Bethesda Softworks. The game was called The Elder Scrolls: Arena. Bethesda was one of the smaller publishers creating their own distinct types of games. Despite its small size the company was very ambitious. Initially, Arena was supposed to be a fighting game taking place in an arena. During its development a city was added where the arena was located so that the player could go to the shops and purchase weapons. Gradually a whole virtual world was added around the city so that the player could undertake quests to acquire new skills and better weapons. Arena was released as a first person, real time, role playing game. It was not a major commercial success but it did well enough to justify a follow up. Daggerfall was released in 1996. In 1996 Bethesda released The Elder Scrolls 2: Daggerfall. The game was enormous in size and scope. The landmass was approximately the size of Great Britain in real life. It was filled with villages, towns, cities, tombs, dungeons and other locations of interest. Some of these locations were vast. A typical city was so large that the player could spend 20 minutes walking across it in a straight line. Exploring a city of this scale and interacting with the populace would take days of gameplay. Such a city was just one location on the world map that included over 15,000 towns, dungeons, temples, and much more. 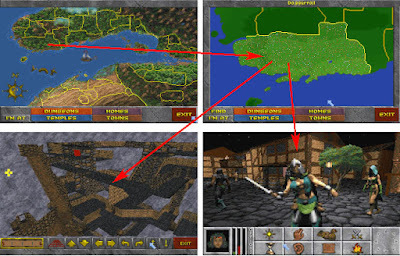 Clockwise starting at top left: world map, Kingdom of Daggerfall map, a dungeon, a city. The picture above, on the top left is Daggerfall’s world map. The yellow lines show the borders between regions. The kingdom of Daggerfall is just one of these regions. The top right picture shows just the kingdom of Daggerfall one of the many regions in the game. Each dot (pixel) on the map represents a town, dungeon, or other points of interest that the player could explore. The bottom left picture is the map of a dungeon. Many dungeons were large and complex with multiple levels and secret passages. Sometimes part of dungeons were submerged in water and infested by Slaughterfish. Morrowind was released in 2002. 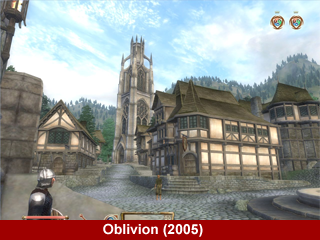 Oblivion was released in 2005. ﻿On top of this vast world was a role playing game of unprecedented freedom. The player could design his/her own character and use many different types of weapons, armour, magic, clothes, enchanted artefacts with mysterious powers and many other objects. The player could own a horse and even add a cart to it. Looting dungeons was a rewarding activity! Fallout 3 was released in 2008. At the start of the game the player was assigned a primary quest and a secondary quest. Most of the other quests were dynamically created and assigned to the player. The game could be played for ever. 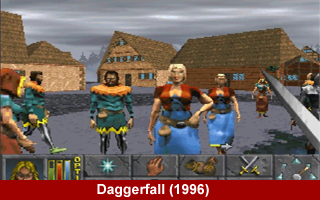 Daggerfall was a first person, 3D, open world game. ﻿﻿Was Daggerfall ambitious? Yes, it was. But how could such a small team produce something of this scale? They did it by using procedural generation for the terrain, towns, dungeons and the missions. And it all worked on a PC in less than 640 kilobytes of memory. Today’s consoles and computers have thousands of times more power. 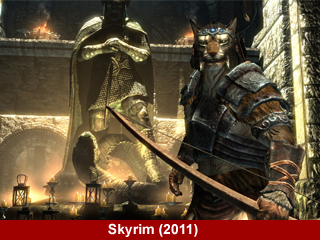 Skyrim was released in 2011. The third part of the main Elder Scrolls series was Morrowind and it was released in 2002, six years after Daggerfall. 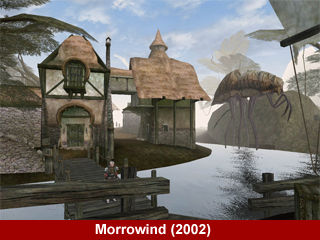 Mororwind was 10,000 times smaller in size than Daggerfall but it was also 10,000 times more detailed. Bethesda had tweaked its formula, trading scale for attention to detail. It had state of the art graphics and it was the first Elder Scrolls game to be released on a games console. For the first time Bethesda received praise from mainstream game critics. Fallout 4 to be released in 2015. ﻿The rest is history. 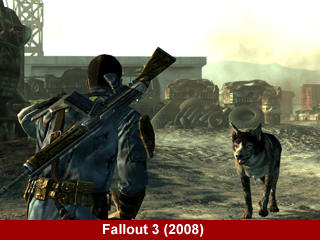 Bethesda Game Studios went on to produce such games as Oblivion in 2006, Fallout 3 in 2008, Skyrim in 2011 and Fallout 4 in 2015. All are based on the same formula of open worlds, freeform gameplay, attention to detail and player choice. 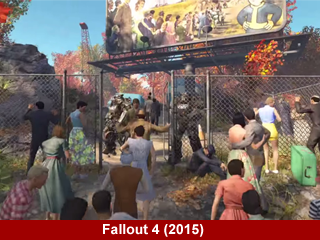 It has been a long journey for Bethesda between Arena in 1994 and Fallout 4 in 2015. 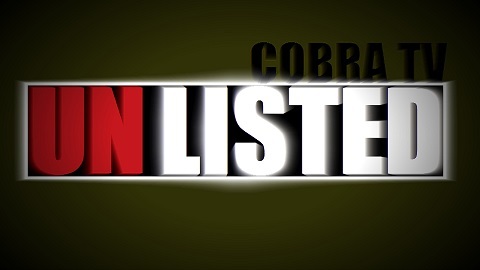 The company has steadily increased its fan base with every new game but it took approximately 20 years to receive widespread recognition for its innovative games. Bethesda Softworks is now one of the world’s major publishers in the video game market as they demonstrated at E3 in 2015. If there is a game that is particularly ambitious, it has to be No Man’s Sky by Hello Games. It has many of the same characteristics as the original Elder Scrolls games. It boasts vast procedurally generated worlds, freeform gameplay and player choice. 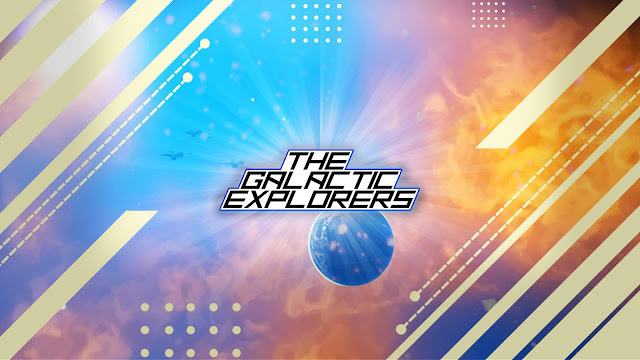 It offers the player the opportunity to explore billions of billions of planets in a real life sized galaxy. However, once again not everybody is convinced. The reception prior to its release has been mixed. It is certainly not receiving the praise that such a revolutionary title deserves. Is No Man’s Sky ahead of its time? Is it too revolutionary for most gamers to appreciate? Only time will tell. 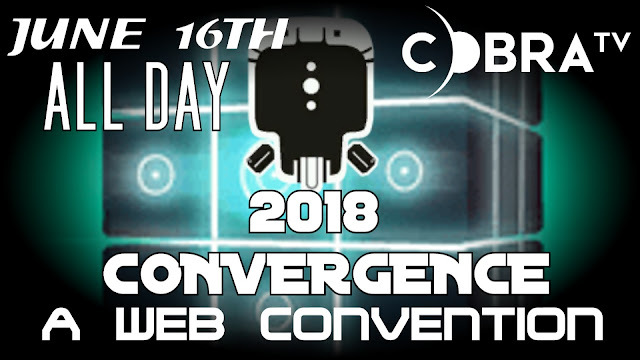 In today’s internet connected world news travels quickly. It will not take 20 years for Hello Games to become one of the great stars in the centre of the game industry galaxy. Its journey started at the periphery of its galaxy attempting to travel all the way to the centre. The journey will be long and perilous but the potential rewards unimaginable. Hello Games will be planet hopping all the way to the centre of its galaxy but it must stay clear of the massive stars that will inevitably block its way and the super massive black holes that will trap everything in their event horizons. Whatever the outcome, this is the journey of a lifetime. 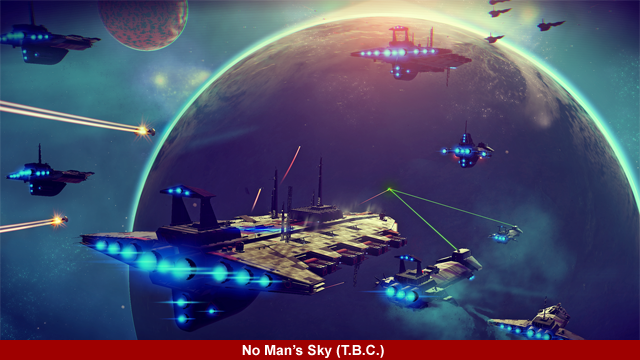 No Man’s Sky will create a legacy in the video game galaxy like no other game before it.